Prof. R S Rao (74), retired professor from Sambalpur University, a long time intellectual of radical politics in India passed away on 17 June 2011 in New Delhi. He had suffered a stroke and was in the ventilator for around twenty days. The inevitability of death takes away from us his lively and jovial company and the sharp intellect combined with unswerving commitment to the cause of the common people. Remembering the critical Marxist tradition of R S Rao, we would like to argue herein that it would not be appropriate to portray him as an uncritical loyalist of Maoist politics in India. On the other hand, it would be more appropriate to view him as someone who upheld the critical tradition of questioning and debates within the movement, something which is not commonplace in the Communist movement in India today. It was a rare combination that R S Rao was a teacher of quantitative economics who taught econometric techniques in the class room and was a theoretician of Marxist political economy outside the class room. Quite uncharacteristic of economists in general, he was an economist who used to speak a lot about people and people’s agency. He used to say, Stalin hardly spoke about people but about material goods. He had a strong historical sense and was optimistic to the core. He believed that systematic application of methodology, as while doing a Ph.D., hampered creativity. He himself never did a Ph.D. He was not overwhelmed by scholarly papers in national and international journals. Rather he attached greater value to articles in activist publications because ‘they have a sense of purpose’, as he put it. He seldom contributed to the mainstream press. Prof. Rao used to say that in order to understand, we need to focus not on the aspect of light but on the aspect of shade. In life too, he had moved from the light of the Gokhale Institute in Pune to the shade of Sambalpur university located in a backward region. During the hype of developmentalism in the early Nehruvian period, when there were many who praised the building of big dams, he focused on the shady aspects of displacement and misery caused by the Hirakud dam project which he considered as a symbol of exploitation. He had said that even in the ‘modern temples’, those who built them have no entry. Prof. Rao was steadfast in his commitment to the cause of the people until his last days. It may be recalled that he was one of the mediators in the case of the abduction of Collector, Vineel Krishna by Maoists in February 2011. Although my personal encounters with him were limited to those in late 1990s, they were memorable and intellectually enriching. I would miss Prof. R S Rao, especially since I could not meet him for so many years now. As it is said, Prof. Rao had an ability to leave a strong impression on some people even in one meeting or two. About his person, I remember not only his personal habit of continuous smoking but also his non-hierarchical attitude and the hearty laugh he had, showing his toothless gum. He had a Socratic quality of intellectually guiding the youth through sharp and timely questions. This was very important about his personality since it is said that he still operated mainly within the oral tradition since his writings are few and far between. His first collection of essays, Towards Understanding Semi-Feudal, Semi-Colonial Society was published in 1995 with a famous essay, ‘In Search of the Capitalist Farmer’. He has also co-edited with Venugopal Rao a collection on 50 years of the History and Development in Andhra Pradesh. Of late, five books and some essays by him have been published in Telugu. In his socio-economic analysis, he had an ingenious way of drawing insights from Telugu literature. In March and April 1998, he had taken a few parallel classes for some interested students at Jawaharlal Nehru University. His analysis of Marxian dialectics and his observations on how the semi-colonial relations related to the semi-feudal ones in the Indian context were insightful. It still resounds in my memory how he summarised Marxian dialectics in three terms: totality, contradiction, change or movement in time. During those days, once he chanced to find me with a book of P J James (1995), Non-Governmental Voluntary Organizations: The True Mission. He asked me to review this book for him. So I wrote a review of this book. The main idea of the book was that NGOs were serving the cause of imperialism by diverting people away from the path of class struggle. R S Rao guided me by posing mainly one question: ‘In what specific way(s) do the NGOs turn diversionary?’ He guided me into thinking that they turn diversionary by having no sense of primacy among social contradictions. For example, they would not address the land question but would rather address social contradictions as related to caste, community and gender i.e., those relating to social liberation movements, not directly counterpoised against the State but against one or the other dominant section in society. He had approved my book review, saying it required only some editorial corrections. But unexpectedly, I had to get into a heated argument with a prominent mass leader of the Maoist movement, specifically on the political line of this review. He was very angry and became very personal in his criticism because he felt that I was being too generous towards the NGOs in spite of recognising the neo-colonial agenda many of them were promoting. After this argument, I lost my confidence and did not send the article for publication anywhere. But I could not help wondering how much divergence of views can be there within the same political movement, among those with the same ideological persuasion. Probably, Tariq Ali was right in pointing out in a recent book review in New Left Review (2010, Nov.-Dec.) that it was something tragic that happened to Communist Parties across the world that they became established mass-based parties in the 1930s and ‘40s during the high tide of Stalinism. The organisational methods they adopted, influenced as they were by Stalinism, stifled dissent and suppressed debate. Probably, this explains how the Communist movements the world over moved away from the early Bolshevik tradition of vibrant debates within the party and in the Indian case, from the vibrant intellectual tradition that characterised Bhagat Singh and his comrades. It is worth recalling an exchange of views in late 1990s between Prof. Rao and a trade union activist working in the industrial areas in and around Delhi. This comrade-activist had left CPI-ML (Red Flag) in Kerala and joined the stream of Andhra Naxalites. He had left the Red Flag group specifically on the question of this group giving up the policy of armed struggle. Prof. Rao asked him what were the differences which led him to leave Red Flag. He listened to him very carefully and at the end of it, he asked quite emphatically, ‘Is your line a political line or a military line?’ Probably, what he meant was that the political line needs to have primacy over the military line. This is a question worth repeating over and over again today in the context of a neo-liberal State on the one hand, hell-bent on wiping out the Maoists, who are branded as ‘the greatest internal security threat’ and the Maoists on the other, confining their resistance mainly to the military realm rather than on primarily engaging in mass mobilisation around their political line, focusing on the question of people-oriented development. Maoists could be better off if they had primary focus on the political line involving mass movement wherever possible since the State has much less legitimacy in this respect although it is immensely more powerful militarily. It is ironical that one has to speak about bureaucracy within the Maoist movement because it is a far cry from the Mao’s own ideas of party as a contradiction and party developing through contradictions. But whenever I did talk to Prof. Rao about the problem of bureaucracy within the movement, he was kind enough to tell me not to get discouraged since there are many sincere persons in the movement who are quite self-critical about the movement. He pointed out how (late) Shyam, one of the Central Committee members of CPI-ML (People’s War) was such an honest person who during the peace talks, was willing to accept criticisms about mistakes committed by the movement. It is not to be missed out that from within the stream of radical politics, Prof. Rao had also come under criticism for not focusing sufficiently on the ‘semi-colonial’ which was gaining increasing ascendency over the ‘semi-feudal’ under ‘liberalisation’. But he seemed to have been more concerned about how one is related to the other. It was not easy to brush aside his argument about a process of ‘re-feudalisation’ in culture and institutions, including the State with the increasing incursions of capital. We could also justify his position from an entirely different angle: Even if the ‘semi-colonial’ or imperialism is considered as the principal contradiction, the struggle for fixed productive assets/natural resources – land, forest and water resources – could constitute the principal task of social transformation in a crisis-ridden and highly unpredictable world order of today. There would have been times when the movement imposed blinders upon his process of thinking even as it must have enabled him other ways. 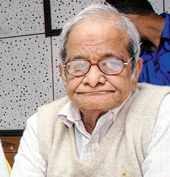 Although there are those both within and outside the Maoist movement who would like to appropriate Prof. Rao as an uncritical loyalist of the movement, I would like to remember him as someone who belonged to the stream of critical thinking within the movement – an early Bolshevik legacy in the international communist movement and also a legacy left behind by Bhagat Singh in India. « Financialization, Household Credit and Economic Slowdown in the U.S.